1 banks | This Blog Rules | Why go elsewhere? “Money makes the world go round,” they say. “Money makes the world, full stop,” would be the reply of Perniclas Bedow, creator of a world of copper, gold and silver coins. 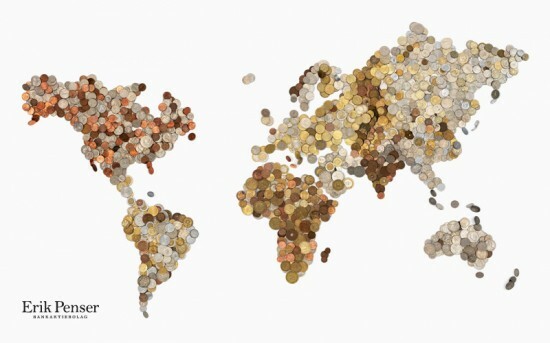 Arranged by Swedish design studio Bedow, the piece is a world map made entirely out of over 3,000 coins from around the world: in a stroke of artistic genius, each continent was built using its own currency.